Hotel This is the boutique hotel that has Balinese style guest rooms and beautiful garden located in front of Monkey Forest, the famous place of Ubud. 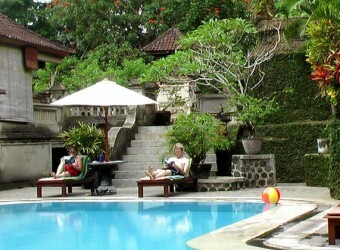 Champlung Sari Hotel is very convenient hotel that is near from many shopping stores and restaurants. There seems that a monkey appears to look for bait in the site early morning, because it locates near Monkey Forest.